For use in Resting ECG's, Echo Procedures, Body Fat Measurements. Disposable ECG electrode, white foam type 1/16" thick by 1-3/4" high by 0.937". A center snap with conductive, liquid gel column. Aggressive medical grade adhesive. Supplied ten to a release strip, 100 per box. 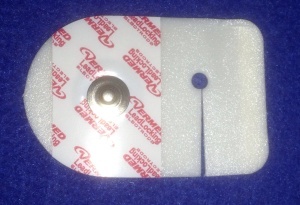 This snap-button, wet-gel electrode is designed for difficult adhesion conditions that occur in Holter patient monitoring and exercise stress test applications, or anywhere that excess moisture may be a problem. 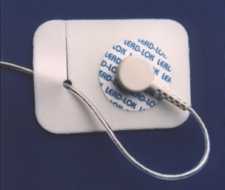 This Lead-Lock electrode has tape-lock tab attached to electrode to secure lead wire. This reduces lead-wire artifacts during stress test. Hypoallergenic, non-irritating, meets and exceeds all AAMI performance specifications. Size 1/16" thick by 1-3/4" (45mm) round. Size 1/16" thick by 1-3/4" wide by 2-3/8" long.